Cognizant (NASDAQ: CTSH) is a leading provider of information technology, consulting, and business process outsourcing services, dedicated to helping the world's leading companies build stronger businesses. Headquartered in Teaneck, New Jersey (U.S.), Cognizant combines a passion for client satisfaction, technology innovation, deep industry and business process expertise, and a global, collaborative workforce that embodies the future of work. With over 100 development and delivery centers worldwide and approximately 221,700 employees as of December 31, 2015, Cognizant is a member of the NASDAQ-100, the S&P 500, the Forbes Global 2000, and the Fortune 500 and is ranked among the top performing and fastest growing companies in the world. 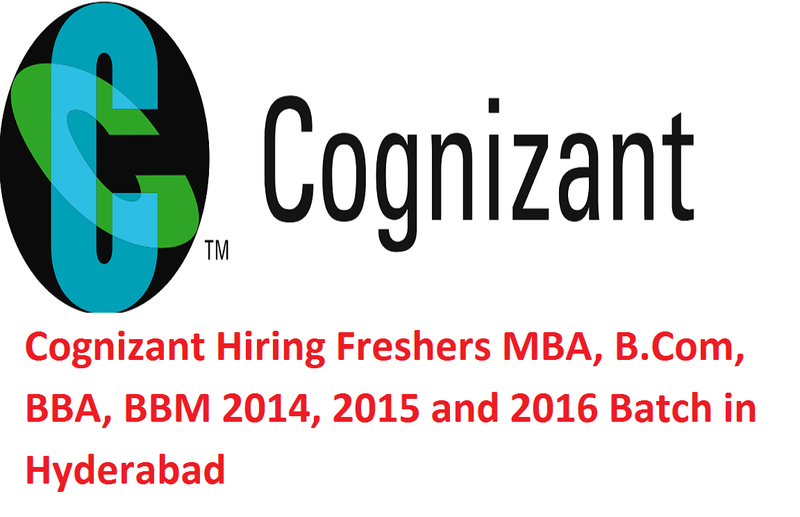 Dear Candidate, Cognizant is hiring MBA / B.Com / BBA / BBM and B.Sc fresher’s in Hyderabad. Only 2014, 2015 and 2016 pass outs are eligible to attend this recruitment drive.